RTÉ celebrate International Women's Day on March 8th with a vivid documentary portrait of Eavan Boland, a writer who has been called "the first great woman poet in the history of Irish poetry." 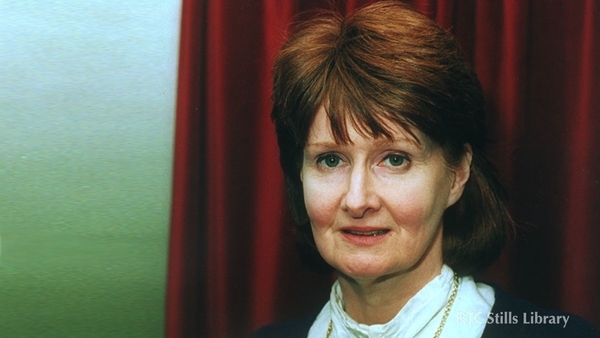 Eavan Boland: Is it Still the Same? explores Eavan Boland’s unusual background (her father was a distinguished diplomat, her mother an artist); her experience of early exile in London and New York; her struggle to find her place in the male-dominated poetry scene of Dublin in the 60s and involvement in the Irish Women’s Liberation movement; and the discovery of her poetic voice and subject matter in the Dublin suburbs of the 1970s. Eavan Boland’s move, with her young husband, to the newly expanding suburb of Dundrum was for her a re-birth. She has lived in the same place since and, for over 40 years, has captured its ordinary riches in poems that are held dear to so many readers. In poems like Night Feed, The Pomegranate and War Horse, she created a near-mythical world where the joys and tensions of married life, the challenges and delights of motherhood are explored and celebrated. Like all great writers, her work makes the ordinary extraordinary. As well as exploring her enduring marriage to writer Kevin Casey and her role as mother and grandmother, the film will examine Eavan Boland’s long and sustaining friendship with former President of Ireland Mary Robinson. On the morning of 12 December 1970, when Mary Robinson got married against her family’s wishes, she left from Eavan Boland’s house. This fact alone is evidence enough of the intimacy of the very ordinary friendship between two very extraordinary women, each of whom has carved out a new path for other women to follow in their footsteps. In addition to Mary Robinson, writers Paula Meehan and Tobias Woolf offer intriguing insights into Eavan Boland, both as a poet and colleague. The film also celebrates the space, excitement and recognition that America has offered to an Irish writer described by one distinguished American critic as ‘one of the finest and boldest poets of the last half-century’. But if America embraces Boland, she in turn embraces it. For over 20 years, as Professor of Creative Writing at Stanford University, California, the United States has given her a living, an imaginative space and, like so many Irish writers before her who sought or were forced into exile, a new prism through which to view her own country. Is it still the same? The documentary will be screened by RTÉ One to mark International Women’s Day, because, above all, Eavan Boland sees herself, unambiguously, as an Irish woman poet. For Boland, each of those three words – ‘Irish’ ‘Woman’ and ‘Poet’ – bears equal weight, and this remarkable film is not only a celebration of one of Ireland’s greatest poets, but one of our greatest defenders of women’s rights.